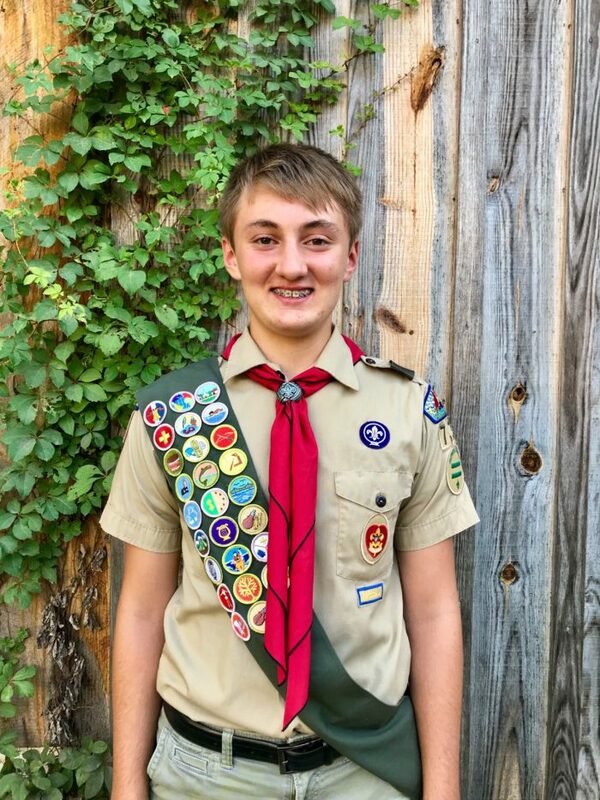 Joshua Johnston built the wooden train playset as an Eagle Scout project. Visitors to New Hope Valley Railway (NHVR) on Sunday, Sept. 9, 2018, can take a ride on passenger cars pulled by a real locomotive and watch model trains operate on the Garden Railroad (G Scale). 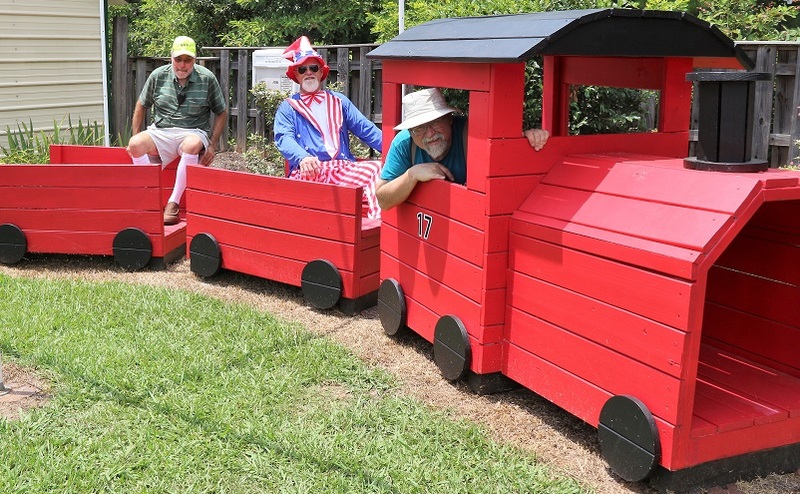 During the tourist railroad’s Thomas in the Garden event, attendees will also see its newest addition–a wooden climb-aboard train playset built as an Eagle Scout project by a young railfan who visited NHVR as a child. Joshua Johnston, a 15-year-old Holly Springs High School student, worked more than 200 hours with roughly 20 volunteers that he directed to build the child-size model train. 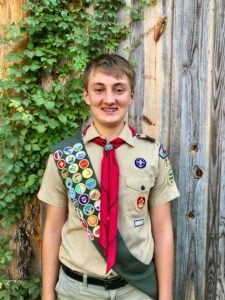 Johnston is a member of Boy Scout Troop 731 of the Black River District in the Occoneechee Council. The wooden train consists of three separate pieces –- an engine and two train cars. The engine and back car were designed for children to climb and pass through, and the middle car has two benches for sitting. Most of the train pieces were built and painted offsite, while the playset’s final assembly and touchups were done in the rail yard. On Sept. 9, operating near the new playset on 1,000 feet of miniature track will be four Thomas and Friends™ model cars, including Thomas #1 with Annie and Clarabel; Percy #6 with assorted Troublesome Trucks; James #5 “Ice Cream Train” with Milk Tanker, Cream Tanker, Raspberry Syrup Tanker and two Ice Cream wagons; and Toby #7 “Vintage Train” with Henrietta, Victoria and Elsie. These model trains are on loan from garden railfan and North Carolina Garden Railroad Society member Joe Austin. They typically operate on 150-feet of track he and his wife built in their Apex backyard but will be joining NHVR’s larger collection of miniatures for the day. NHVR’s G Scale features tunnels, bridges, plants, trees, houses, churches and its own engine house. There are multiple tracks for several trains to run simultaneously. Train tickets for Thomas in the Garden on Sunday, Sept. 9, cost $8 – $12. Trains depart at 11 a.m., 12:30 p.m. and 2 p.m.
NHVR, an operating division of the North Carolina Railway Museum, is in Bonsal, N.C., 30 minutes from Raleigh off Old U.S. 1 South on the Wake-Chatham county line. Purchase tickets online at TriangleTrain.com. Upcoming events at the rail yard include Brew ‘n’ Choo Pizza Party on August 25, Beer, BBQ & Choo Choo on September 29, Track or Treat: Halloween Express on October 13, 20 and 17, and Santa’s Reindeer Roundup Express on December 1, 2, 8, 9 and 15. The full 2018 ride schedule is at TriangleTrain.com/schedule. Get Ready for Our 2019 Season – The Schedule of Events is here!